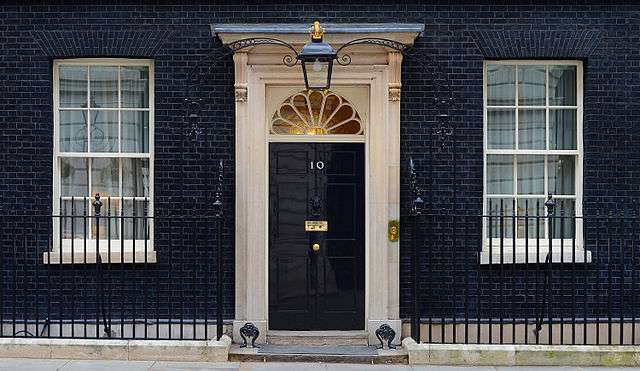 London’s Downing Street, home of the British Prime Minister, was built by a Puritan from Massachusetts who switched sides in the English Civil War. George Downing was John Winthrop’s nephew, a member of Harvard’s first graduating class and a soldier supporting Oliver Cromwell’s rise to power in England. When Charles II restored the throne, Downing conveniently changed his allegiance, spied on his former friends and got very, very rich. 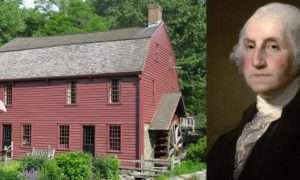 George Downing was so widely despised in the colonies that ‘an errant George Downing’ became a synonym for traitor before Benedict Arnold went over to the British. Historians regard him as one of colonial New England’s scoundrels. Downing was a man of considerable political, diplomatic and financial ability. His enemies often questioned his character because of his willingness to make the most of changing political circumstances and to viciously betray former comrades to win favor from those in power. George Downing was born in 1623 in Dublin, Ireland, to Emanuel Downing and his wife, Lucy Winthrop. Emanuel was a lawyer or barrister of the Inner Temple in London. The Downings were highly esteemed Puritans and apparently careful in planning George’s education. They did not approve of the ‘raucous behavior’ displayed by many of the students at Cambridge. 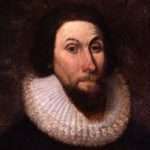 Some historians argue the Downings encouraged Lucy’s brother, John Winthrop, to establish a college as a condition for their move to the new colony. They only immigrated to the colonies when Harvard College was founded and a quality education was assured for their son. Emanuel Downing moved his family to Salem in the Massachusetts Bay Colony in 1638. They lived with then-Gov. 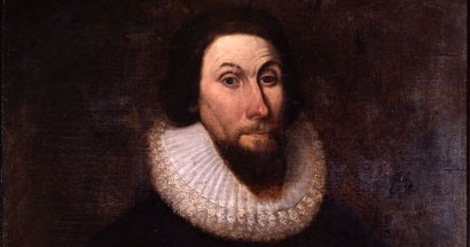 John Winthrop until their house was built. George attended Harvard College and was one of nine students in the first graduating class of 1642. Harvard hired him as the college’s first tutor. George began his professional career as a preacher. In 1645, he sailed for the West Indies as instructor of the seamen. The ship was bringing slaves to work Caribbean plantations. Downing then sailed to England to join Oliver Cromwell’s rebellion against King Charles I. He served as chaplain to Col. John Okey’s regiment in the Parliamentary Army. He would later betray Okey as a regicide. Downing soon abandoned the ministry for a political and military career. In 1650, he was scoutmaster-general of Cromwell’s forces in Scotland. In 1654, he was elected to Parliament from Scotland. That same year he helped his own advancement by marrying Frances Howard, and in 1657 he was appointed Teller of the Exchequer. Downing, among others, unsuccessfully tried to persuade Cromwell to declare himself king. Downing was in Holland as an ambassador when Cromwell died. Sentiment in England had changed, leading to the enthusiastic welcome of the returning King Charles II in 1660. 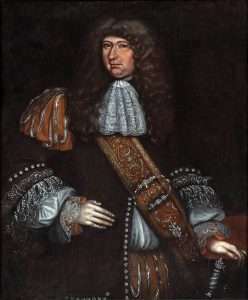 George Downing, loyal to Cromwell, was in danger. He showed himself to be an able diplomat and switched allegiances to Charles II in 1660. Downing explained his change of heart: He was led astray by ‘principles sucked in’ during his time in the American colonies and now ‘saw the error.’ He now abandoned those principles. As proof of his good intentions, Downing handed over some secret documents to the king. His ploy worked. Downing was knighted in May 1660, given his old Treasury job back and granted a tract of land near St James’s Park that includes the present site of Downing Street. During the restoration of the crown, George organized spy rings that hunted down many of his former comrades who supported Cromwell. John Okey, his former commander and sponsor, was arrested in the Netherlands. Downing deported him to England, condemning him to a brutal death. Okey was hanged, drawn and quartered. The diarist Samuel Pepys characterized Downing’s conduct as odious, though useful to the king. He called him a ‘perfidious rogue’ and wrote that ‘all the world took notice of him for a most ungrateful villain for his pains.’ Charles II created a baronetcy for him in 1663. In 1671, George was sent to Holland to break up the Triple Alliance of England, Sweden and the United Provinces in support of Spain against France. He was extremely unpopular in Holland. After three months he was forced to flee to England, in fear of his life. For his unauthorized departure, Downing was sent to the Tower of London in 1672 but released within a few weeks. George was appreciated by a few influential men from New York. 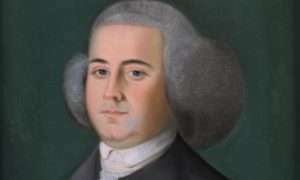 More than any other man he was responsible for arranging the acquisition of New York from the Dutch. Downing Street in Manhattan and in Brooklyn, N.Y., were named in his honor. George Downing died in Cambridge, England, on July 22, 1684, after acquiring a substantial fortune. He was the largest landowner in Cambridgeshire. His eldest son succeeded him in his title as 2nd Baronet. Sir George Downing’s brother John was married to the infamous Mehitabel Braybrooke, accused of witchcraft during the Salem witch trials. Although George and his parents had returned to England, most of his younger siblings remained in the Massachusetts Bay Colony. The author of this story, Donna Gawell, is a genealogist and author, most recently of The Redemption of Mehitabel Braybrooke, to be released by Heritage Beacon in March 2018. She maintains at https://donnagawell.com/. Sir George Downing is high on her list of ancestors of whom she is not proud to claim. Well written! Thank you for sharing this article.